Away in a manger : carol for 2 part choir & piano / [by] W.J. Kirkpatrick ; arranged [by] Paul Paviour. 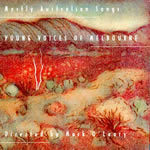 CD: Mostly Australian songs / Young Voices of Melbourne ; [directed by] Mark O'Leary. CD: Waratah Girls Choir in song. CD: Leave no song unsung / The Australian Children's Choir.